herewith the French patent of 1947 mixer, I leave you the care to translate it into English. Much more concrete, on the small Rex, I will use a 2000 ° alumina. this mixer should really mix gas and air well, although I’m not sure if this is necessary for just one cylinder engine. Absolutely no need to excuse. I have to thank you for clarifying me regarding the amount of usable heat. This is done more or less “automatically” in updraft gasifiers with a high gas exit, as you draw the gas through the bed of coal in the hopper (think of Bruce’s MG or Don’s GeoTracker). Thus the hot gas “give” its heat to the coal. For a cross-draft or down-draft, the gas is not in contact with fresh coals before the exit (or just a very short distance) and can’t exchange heat with the coal in the hopper. Thus it leaves the hearth quite hot. This is also true for an upstream gasifier with low gas exit (think of Kristijan’s Charcoal-Mercedes). Less problematic with low quality charcoal (especially the down-draft is Francois is building it), but you can only heat the primary air in a heat exchanger. 2 inch sprocket on motor, 8 inch sprocket on axle, 24 inch bicycle tire equals 51 miles (85 km) per hour at 3000 rpm engine speed. Am I close with those figures? Scary ride? Don, would the diameter of the wheels also play as a factor? Yup, - approx 6 feet per revolution. The gear ratio is 1 in 3 and the development of the wheel is 2 linear meters. I think you might want to allow space for an intermediate shaft (Jack shaft). That will give you an easier way to try different gear ratios until you find the best one for your conditions. You might want to make a way to minimize friction in case of using only pedal power to move the whole bike / trailer system. I am looking forward to seeing good results, and I am a fan! i can’t help it… the end of the roadrunner with the help of Francois ? Even with my gas engine on my motorized trailer on my recumbent bike, I will not go faster than this person from the attached document. I assume the trailer will also be able to have brakes? 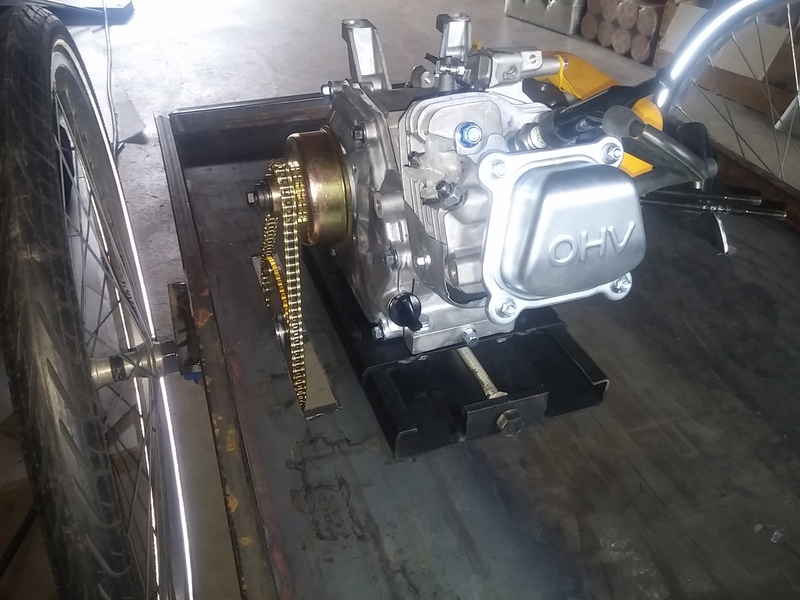 Looking at the Villiers Engine, I see what I believe is a centrifugal clutch mounted on the crankshaft, and then a fixed gear ratio of 3:1. One of my projects used a larger and more expensive Comet torque converter that could be built with different springs and cam followers that would change the drive clutch engagement RPM. The choices were 1600, 2000, 2200, 2400, 2600, and 3100 rpm. Once the clutch was engaged, the torque converter would change the pulley ratios as speed increased. I am looking forward to more posts on your project. Keep up the good work! The point is, althugh it required some practice to drive, l had absolutley no problems with it. Looking forward to the resault of this project! I think an electric clutch would allow one to rev the engine before engaging the clutch. The downfall is, they cost more. 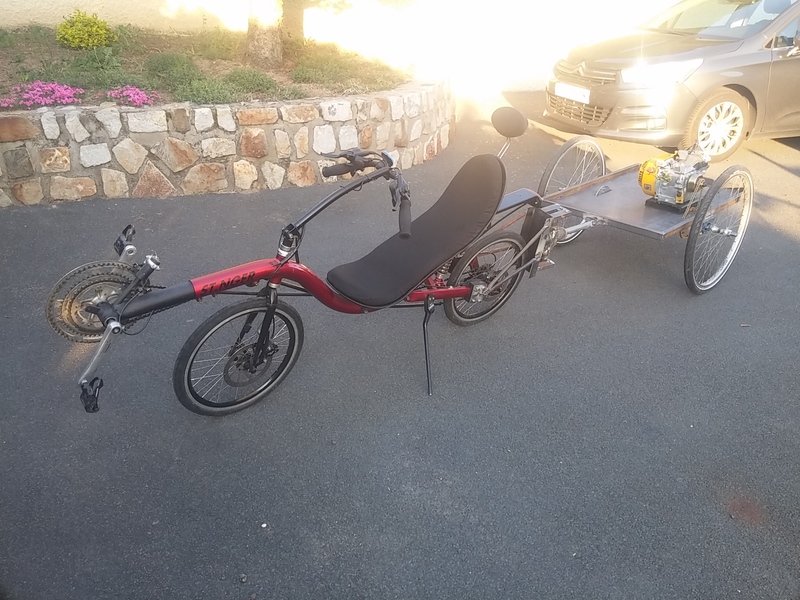 On my charcoal powered motor bike I used a primary belt drive with a hand operated belt tentioner. 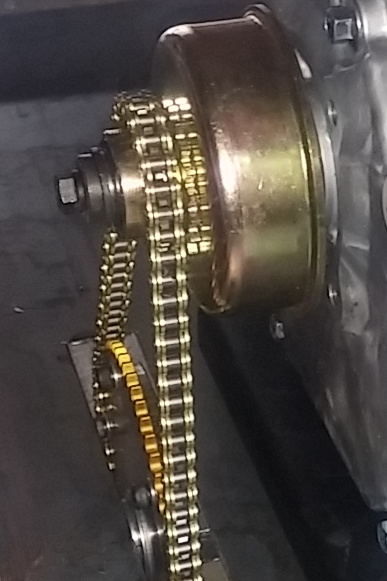 I used a jackshaft to a final chain drive. I used what I had on hand. It is geared to high for my liking. I have to help it a little to get it rolling and it is too fast for he origianl 65 yo tires. 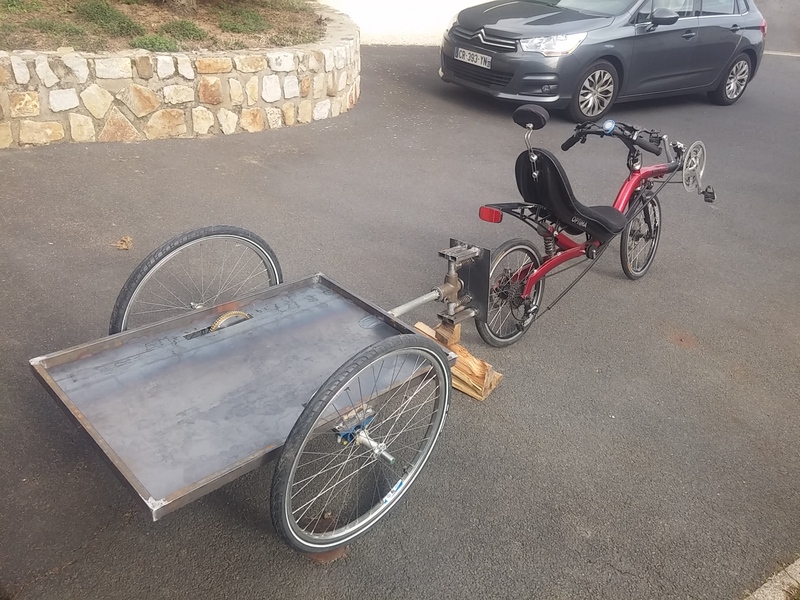 The trailer hitch, recumbent bike is almost finished, more finishes, now it’s the gasifier that needs to be built.